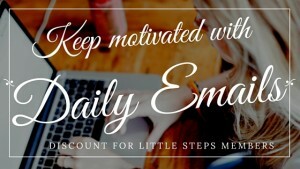 The main thing people tell me they found useful with Little Steps is the daily emails. It gave them something to look forward to, never really knowing what it would be, but they new it would be a little nugget that would give them something to focus on for that day. So now you can continue getting the daily emails for as long as you want! For just £27 per month, you can subscribe to daily emails that will keep you on track. FOR A LIMITED TIME YOU CAN SUBSCRIBE FOR JUST £10 PER MONTH!